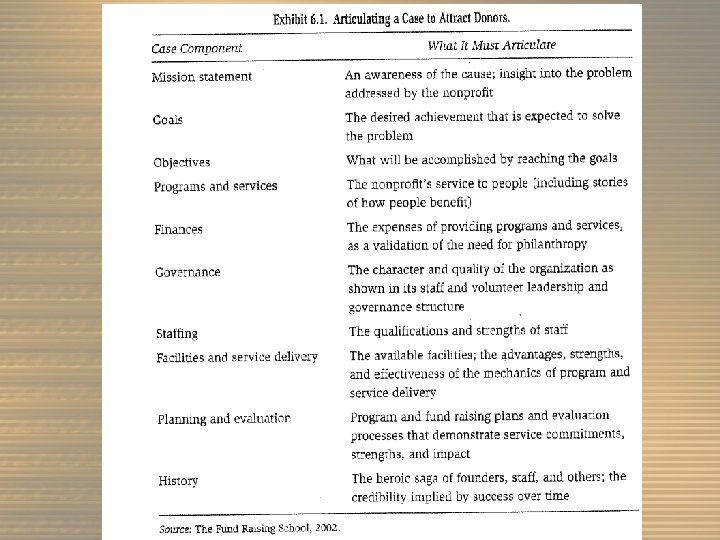 Case For Support Definition—The Case for Support is the set of carefully prepared reasons why the institution merits financial support, including its resources, needs, potential for greater service and future plans. 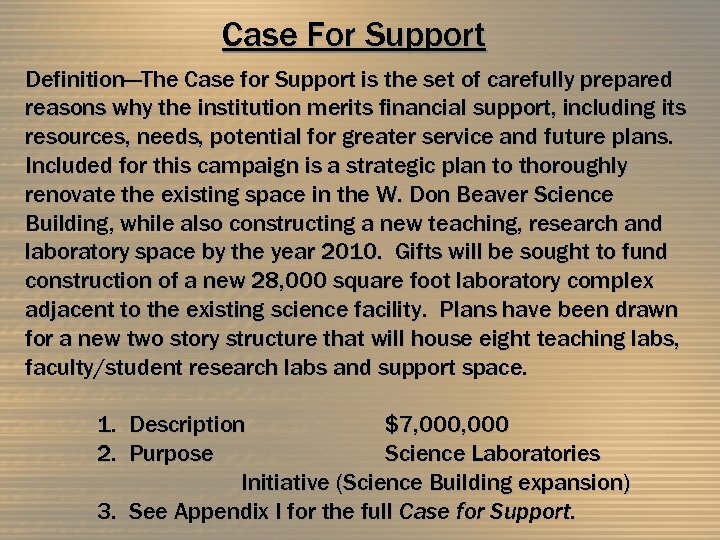 Included for this campaign is a strategic plan to thoroughly renovate the existing space in the W. Don Beaver Science Building, while also constructing a new teaching, research and laboratory space by the year 2010. Gifts will be sought to fund construction of a new 28, 000 square foot laboratory complex adjacent to the existing science facility. Plans have been drawn for a new two story structure that will house eight teaching labs, faculty/student research labs and support space. 1. Description $7, 000 2. Purpose Science Laboratories Initiative (Science Building expansion) 3. See Appendix I for the full Case for Support. Staffing A. 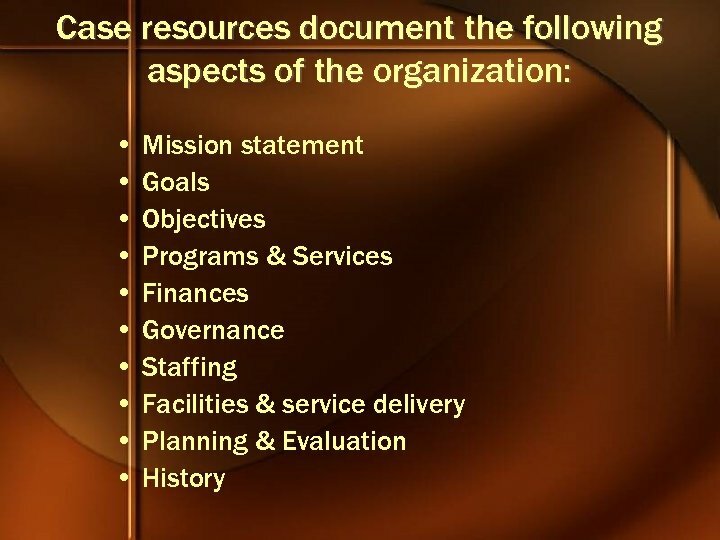 Advancement Staff Organization & Execution 1. Size The effectiveness of the Campaign will depend upon staffing. The leadership and volunteers of the Science campaign will need to have the full-time assistance of the most experienced and able staff available. 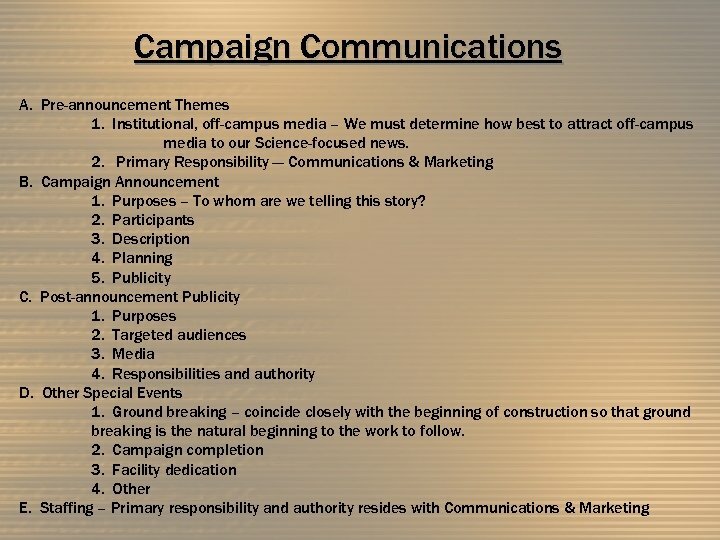 All of the present development officers of the University will be involved in the operation of the Campaign. Among the officers who will have key responsibilities for the leadership and major gifts part of the campaign are: Major Gift Officers (Gresham, Alexander, Crabtree, Martin) Call Matrix/Pace 15 face-to-face in 60 day season (Alexander, Crabtree, Martin) Determine Major Gift Officer Portfolio: 75 or 150 (determine place of stewardship/maintenance of existing prospects). There will be weekly development meetings (President attending monthly). 2. Job descriptions Job Descriptions exist for the Vice-President, Assistant to the President for Endowment Dev. 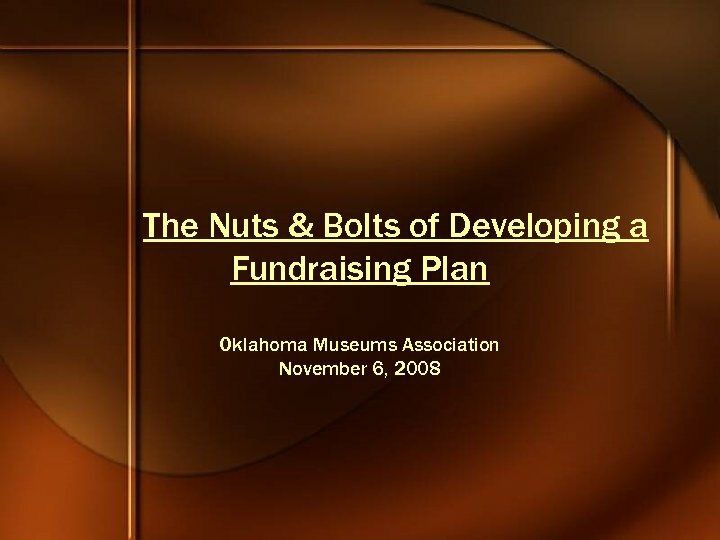 & Planned Giving, and the Executive Director of Development. 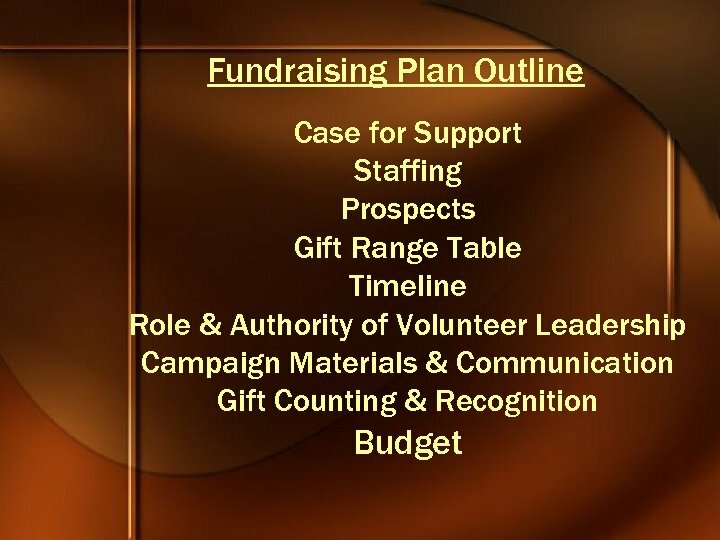 It is recognized as we move forward that SNU is moving toward a sustaining model for fundraising. 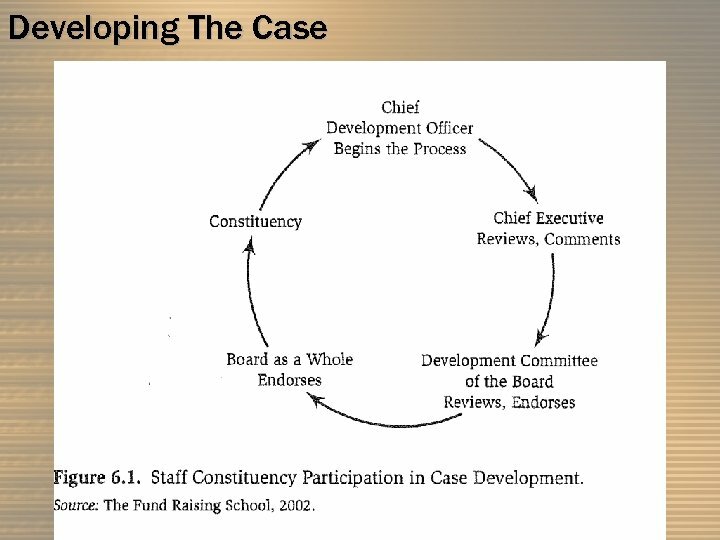 As such, ongoing planning for effective staffing is necessary. Among the future anticipated growth points is a need for a full-time Corporate and Foundation Relations officer. 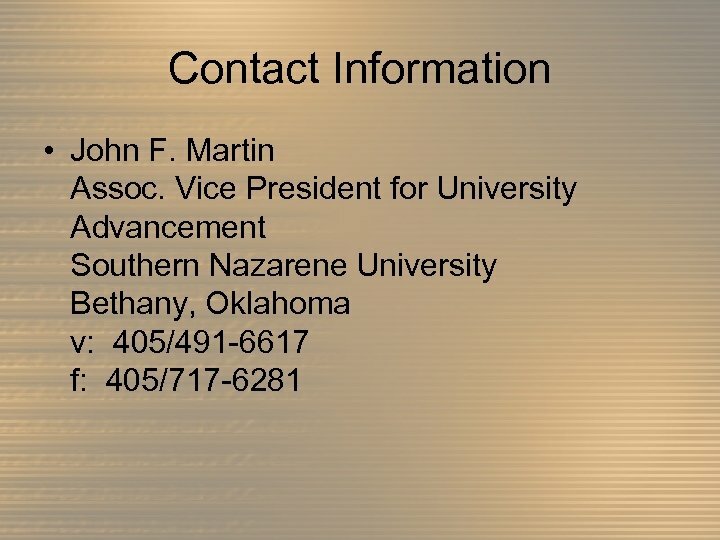 This person would facilitate and significantly prepare foundation proposals at a pace unprecedented for our institution and be SNU’s face to the corporate community. B. Other staff roles 1. President – The role of the President in the campaign is crucial. 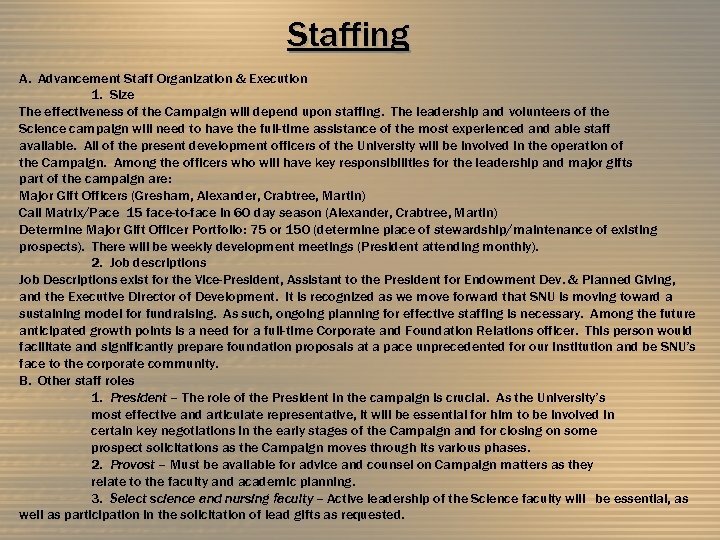 As the University’s most effective and articulate representative, it will be essential for him to be involved in certain key negotiations in the early stages of the Campaign and for closing on some prospect solicitations as the Campaign moves through its various phases. 2. Provost – Must be available for advice and counsel on Campaign matters as they relate to the faculty and academic planning. 3. Select science and nursing faculty -- Active leadership of the Science faculty will be essential, as well as participation in the solicitation of lead gifts as requested. Staffing (contd. ) B. Other staff roles 1. President – The role of the President in the campaign is crucial. As the University’s most effective and articulate representative, it will be essential for him to be involved in certain key negotiations in the early stages of the Campaign and for closing on some prospect solicitations as the Campaign moves through its various phases. 2. Provost – Must be available for advice and counsel on Campaign matters as they relate to the faculty and academic planning. 3. 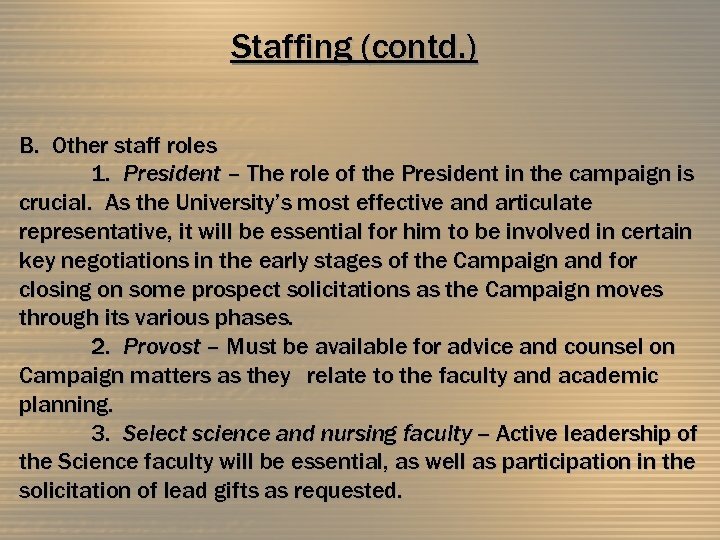 Select science and nursing faculty -- Active leadership of the Science faculty will be essential, as well as participation in the solicitation of lead gifts as requested. B. 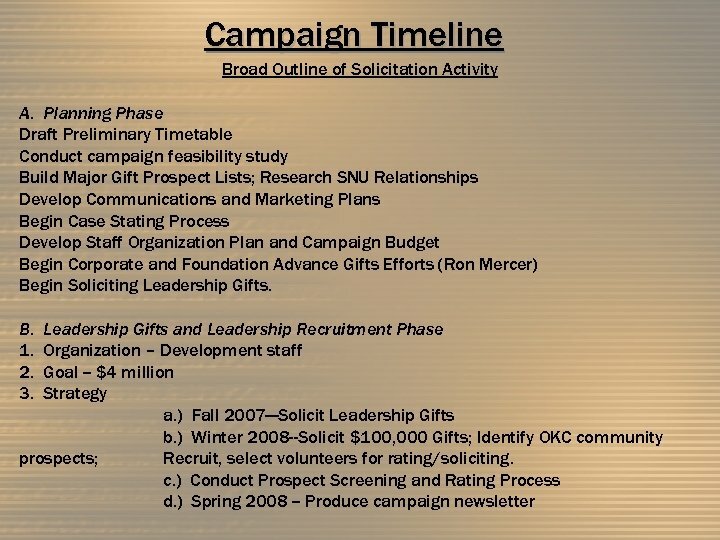 Prospect Identification – Among an identified pool of 358 alumni prospects, we believe there to be approximately 20 identified and viable potential donors of $100, 000 or above whose first giving priority with SNU is the Sciences. 1. 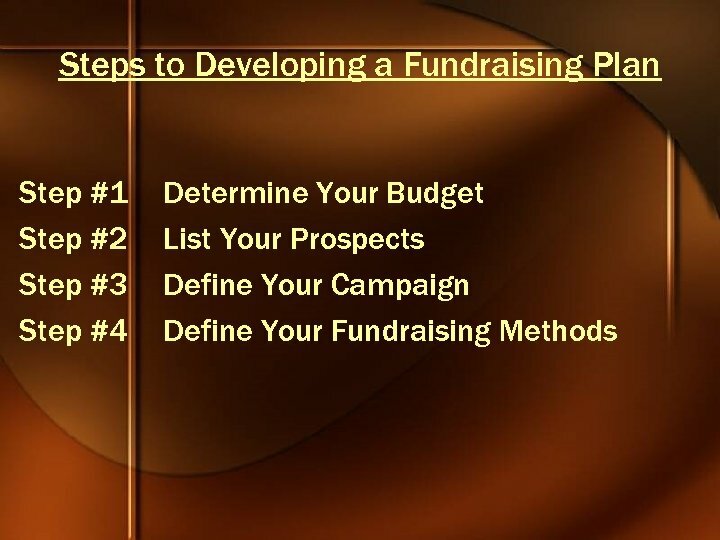 Prospecting Because the overall number of prospects needed is not sufficient, prospect identification and rating will be vital to the success of the campaign. It is recommended that of the various methods proposed for rating, the individual one-on-one method be used predominately. 2. Database analysis and electronic screening – At the time of A Transforming Vision, an extensive electronic screening was conducted with an outside vendor, P!N. 3. Field research -- One-on-one individual prospect rating. 4. Surveying – A decision needs to be made as to whether or not we are going to survey our 3, 000 science alumni to secure employment information from them and to assess their perceptions of our institutional needs for improved equipment and facilities. C. Research 1. Priority – Working within constraints of limited time, resources and staff, every effort will be made to be sure we choose prospects carefully for additional research. 2. 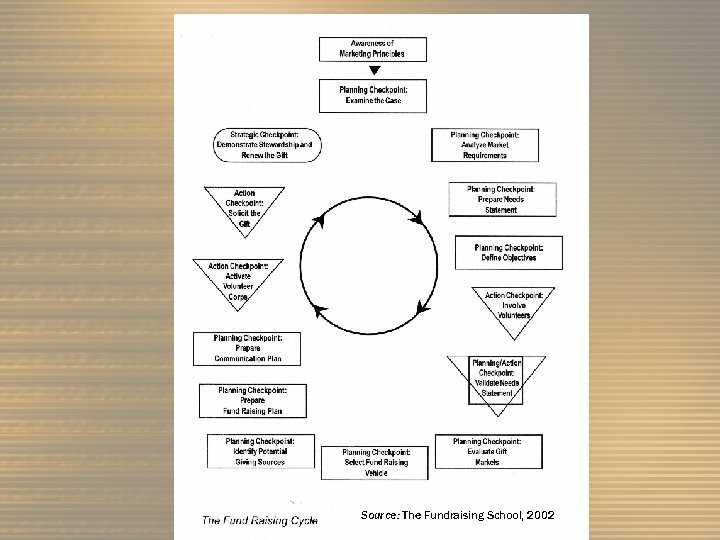 Policies and procedures – Major gift prospecting is a “sights-raising” search for giving potential. Potential is an indication of a person’s capacity to give, not to be confused with prosperity, which is a factor of interest and our ability to cultivate and to sell the program. 3. Security – With respect to donor research, we embrace the confidentiality statement of the Association of Professional Researchers for Advancement (APRA): “Confidential information about constituents (donors and non-donors), as well as confidential information of the institutions in oral form or on electronic, magnetic, or print media are protected in order to foster a trusting relationship between the constituent and the institution. This means that the information is not available for anyone except development professionals, and their agents, to see. 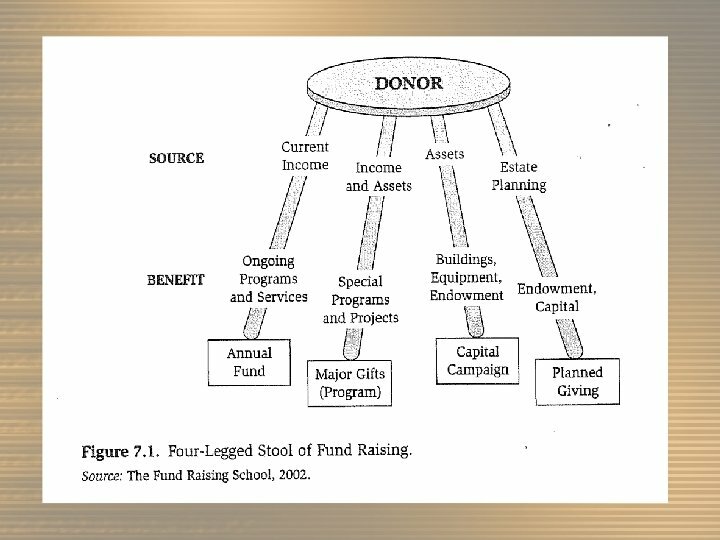 ” D. Portfolio Management The portfolio and prospect management program is managed on behalf of Southern Nazarene University by the Office for University Advancement, in accordance with its designation by the SNU Board of Trustees as the officially designated fundraising office for Southern Nazarene University. 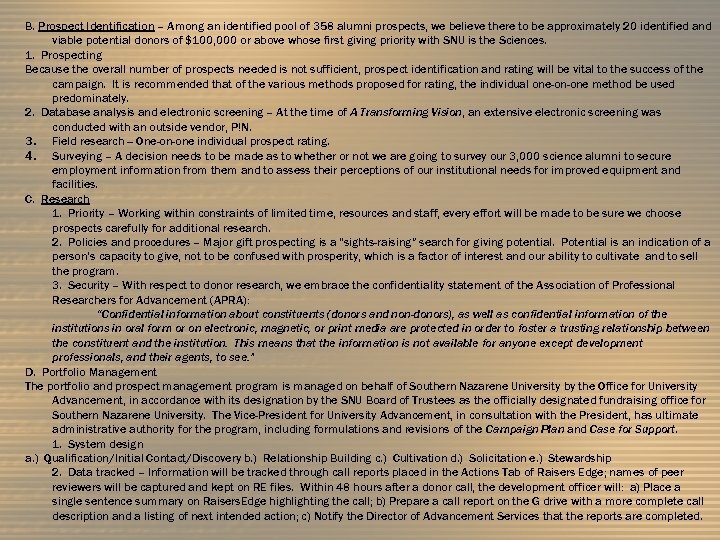 The Vice-President for University Advancement, in consultation with the President, has ultimate administrative authority for the program, including formulations and revisions of the Campaign Plan and Case for Support. 1. System design a. ) Qualification/Initial Contact/Discovery b. ) Relationship Building c. ) Cultivation d. ) Solicitation e. ) Stewardship 2. Data tracked – Information will be tracked through call reports placed in the Actions Tab of Raisers Edge; names of peer reviewers will be captured and kept on RE files. 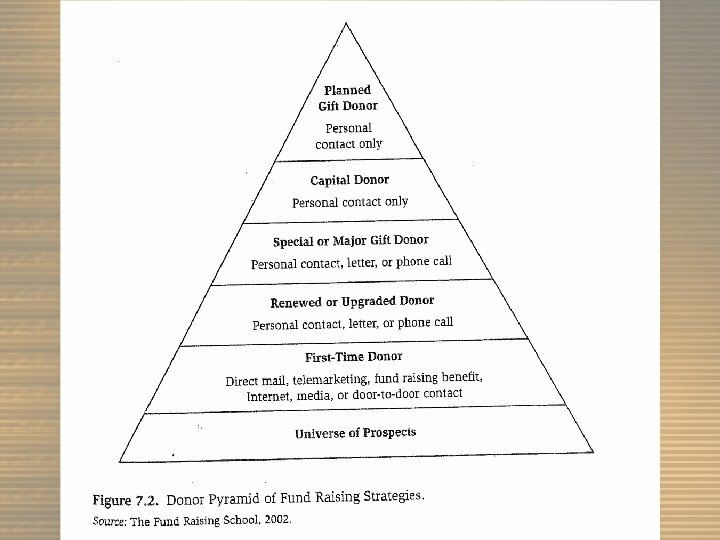 Within 48 hours after a donor call, the development officer will: a) Place a single sentence summary on Raisers. Edge highlighting the call; b) Prepare a call report on the G drive with a more complete call description and a listing of next intended action; c) Notify the Director of Advancement Services that the reports are completed. C. Major Gifts Phase Campaign Timeline 1. Organization – Development staff with very limited volunteer assistance 2. Goal -- $2 million 3. Strategy 4. 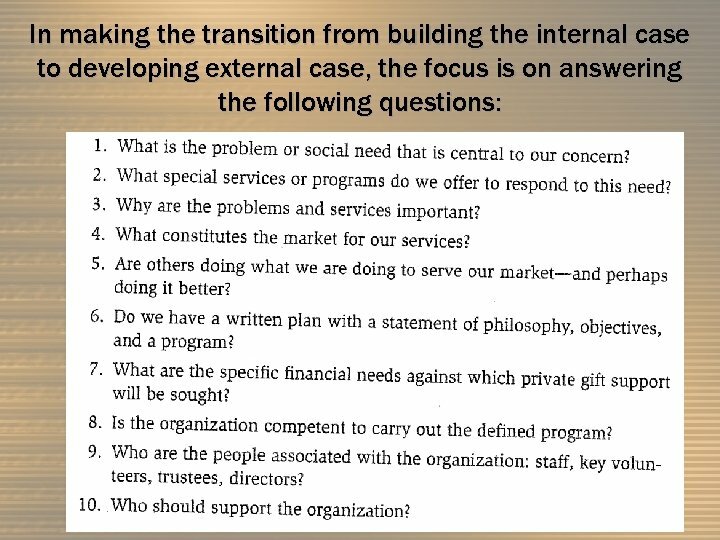 Prospects – Analyze survey information for proposed implementation. D. Public Phase and Special Gifts Plan 1. Organization – Staff with limited faculty and staff and other volunteer support a. ) Public Kickoff Event–January 2009 2. Goal -- $1 million 3. Strategy a. ) 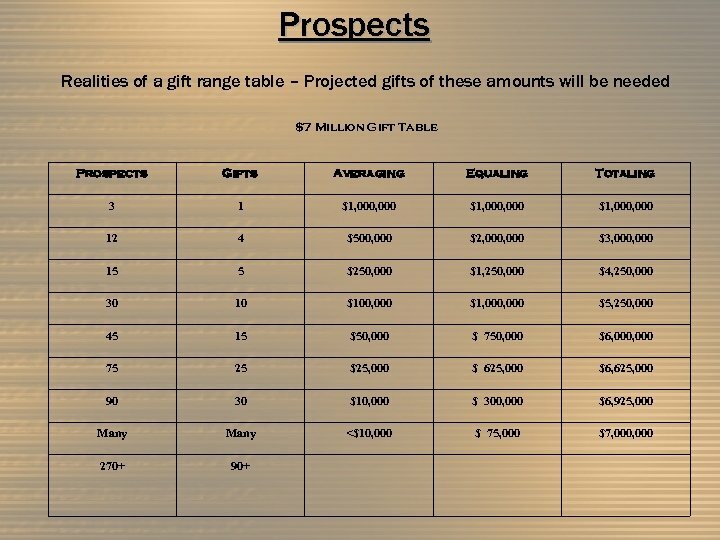 Continue Adding Names to Major Gifts Prospect List b. ) Continue Prospective Donor Contact and Cultivation as Required c. ) Summer 2008—Solicit $25, 000 Gifts d. ) Continue corporate and foundation solicitations e. ) Fall 2008 --Public/Grassroots f. ) Continue Distribution of Campaign Information to News Media and Prospects g. ) Continue to Organize and Train Limited Volunteer Leadership h. ) Ongoing recognition of Donors of Major Gifts i. ) Campaign Victory Celebration 4. Prospects -- Continue to employ survey results for informing prospect visits and solicitations November 1, 2009: Goal for 100 percent of campaign dollar objective. Volunteer Leadership Role and Authority 1. SNU Board of Trustees 2. SNU Foundation Board a. 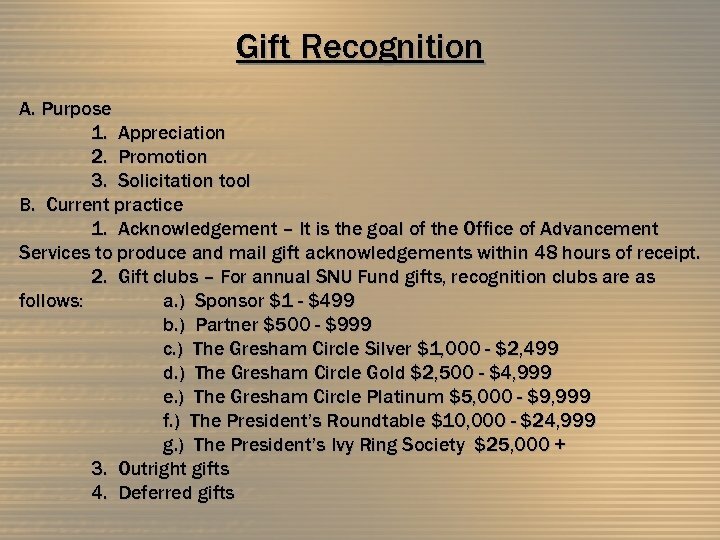 Corporate and Foundation Gifts Committee (with engagement from SNU Foundation Board members and other select volunteers) 3. Project Committee – Science Faculty, building professionals, others 4. 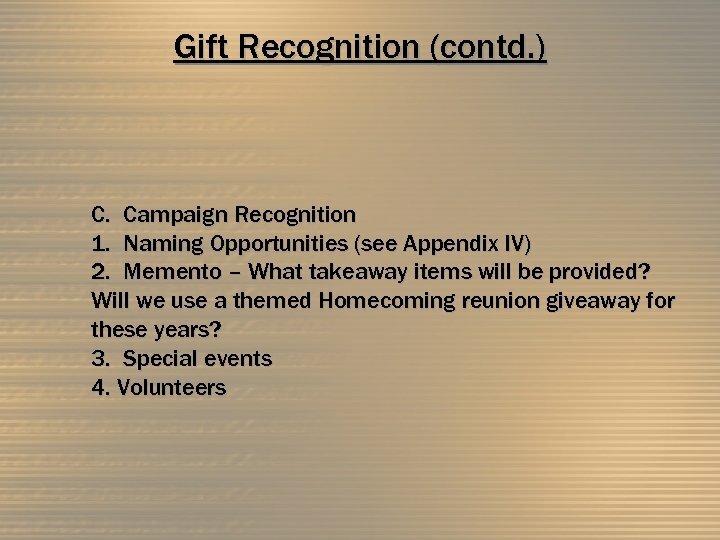 Individual Gifts Committee – select faculty & staff and other volunteers B. Job Descriptions 1. 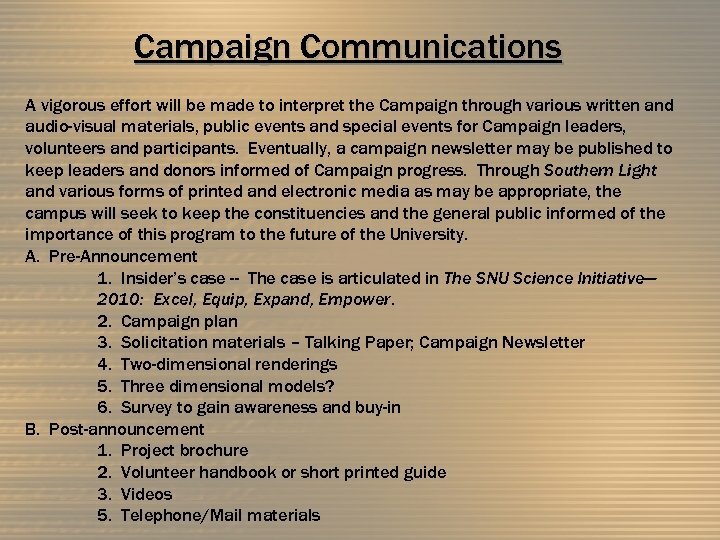 Campaign Committee – limited size, working task group 2. 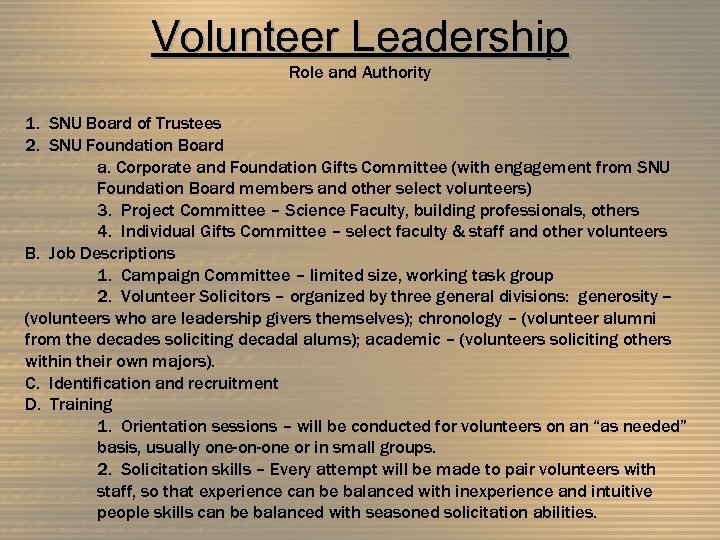 Volunteer Solicitors – organized by three general divisions: generosity -(volunteers who are leadership givers themselves); chronology – (volunteer alumni from the decades soliciting decadal alums); academic – (volunteers soliciting others within their own majors). C. Identification and recruitment D. Training 1. Orientation sessions – will be conducted for volunteers on an “as needed” basis, usually one-on-one or in small groups. 2. Solicitation skills – Every attempt will be made to pair volunteers with staff, so that experience can be balanced with inexperience and intuitive people skills can be balanced with seasoned solicitation abilities. 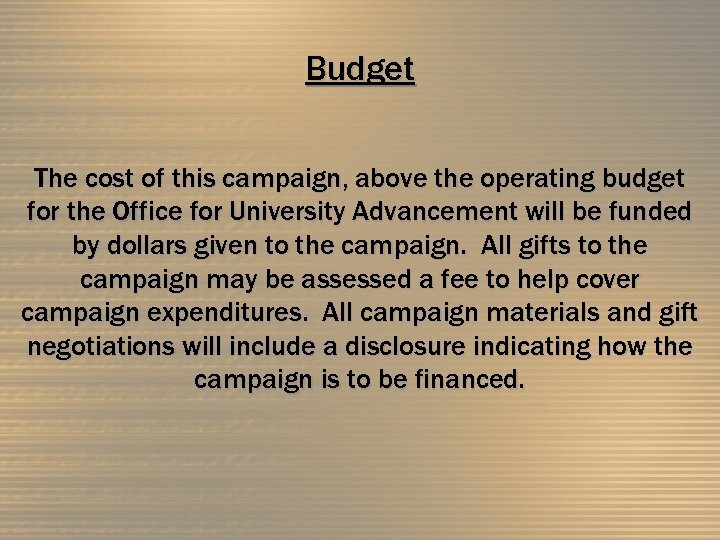 Budget The cost of this campaign, above the operating budget for the Office for University Advancement will be funded by dollars given to the campaign. 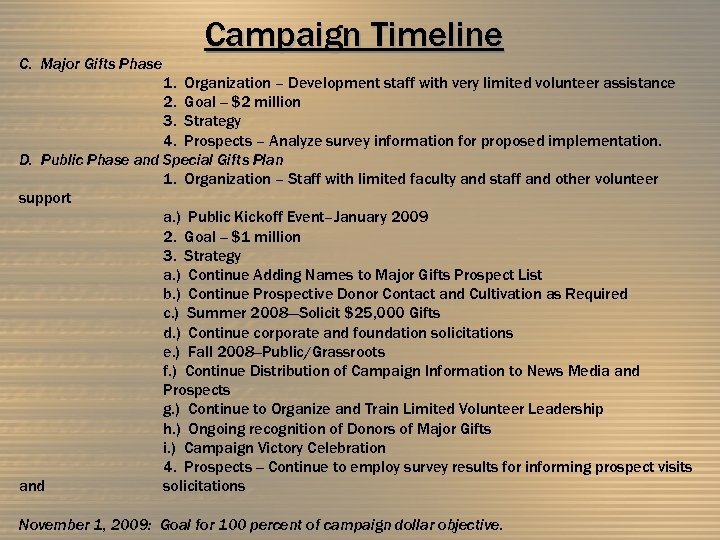 All gifts to the campaign may be assessed a fee to help cover campaign expenditures. 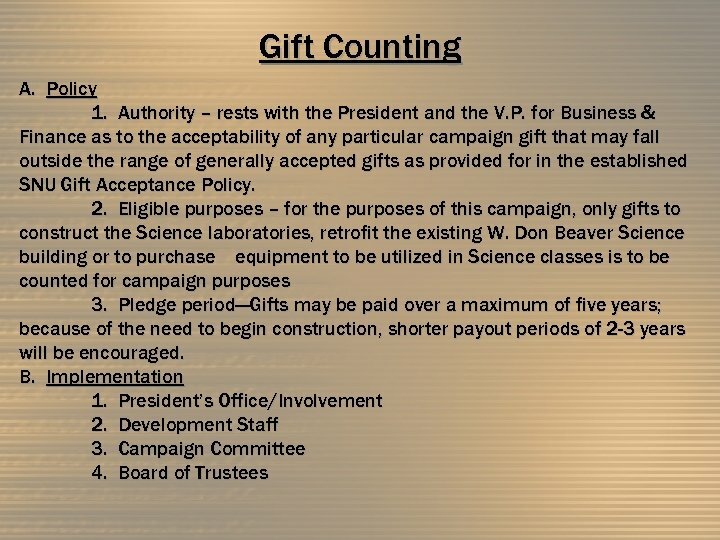 All campaign materials and gift negotiations will include a disclosure indicating how the campaign is to be financed.